I think (and hope) we will see learning systems moving away from managing or controlling users and instead providing open learning environments that enable both formal and informal, personal and group learning to take place. 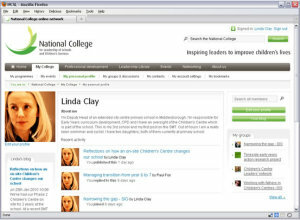 In April 2010, the National College launched just such a system for its members and for participants on its leadership development programmes. This case study tells the story of the development, launch and uptake of the College’s online network, and outlines some lessons that we have learned about the development and the management of this professional networking and learning environment. This long blog post was originally written as an article for the Association for Learning Technology (ALT) Newsletter and it is reproduced here with the kind permission of ALT and the Newsletter’s editor Morag Munro. The National College (originally called the National College for School Leadership) was launched in 2000 as a non-departmental public body to develop the quality of leadership in England’s schools. The College’s broad portfolio of work includes formal leadership development programmes, research, publications and the provision of a wide range of development and support opportunities for England’s 250,000+ school leaders. Online networking and collaboration across the workforce have been at the heart of the College’s work since it first took on the running of the Talking Heads community of practice for headteachers, pioneered by Professor Stephen Heppell. The College’s remit has evolved over time to encompass the development of leaders in early years settings and in children’s services, and in the course of re-launching itself as the National College for Leadership of Schools and Children’s Services in 2009, the College also formally established itself as a membership organisation. In the Summer of 2008, we published an Invitation to Tender (ITT) for an online networking and learning environment to replace our well-known talk2learn system. Since the social software market was an emerging and rapidly-evolving market, we did not want the heavyweight demands of public sector procurement processes to prevent us from reaching the more creative parts of the developer marketplace. This was not a tick-box procurement exercise. Rather, outlining a series of functional requirements that bidders were required to implement, our approach was to identify a series of principles and user-needs, to which bidders were invited to respond creatively. This approach allowed us to receive a range of creative proposals which we might not otherwise have obtained had we produced a more fixed set of requirements. For example, users must be able to start new discussion topics or set up new groups. The application should promote the discovery of people and knowledge and new activity within the environment. Users must be able to find knowledge through people and people through knowledge. After 6 months of the tendering process, we selected Headshift as our partners for this development. As we moved from research and solution design into development we moved into a phase of working collaboratively with the development team at Headshift, who are passionately committed to Agile software development (referred to from here on as ‘Agile’). We learned a lot from working in this way that we feel might be of interest to ALT members. Real-time transparency about the current state of the development. The flexibility to influence the direction of the development as the product evolved and our understanding of it grew. The ability to reprioritise elements of the development in response to changing external needs and circumstances. Secondly, Agile demands strong ongoing collaboration between the client and the supplier. It also necessitates that you have the resource and the capability to participate in the ongoing conversation, testing and decision-making around the development. A real-time view of development. An ongoing place to finesse and influence the development. All of the communication around the development organised and archived in two major places. Tools that reduced the project management reporting burden..
Fourthly, we have been fortunate since the launch to be able to fund further development of the application in response to emerging behaviours and changing circumstances. And it is here that Agile has really come into its own. Working collaboratively with Headshift in series of short development sprints, we have been able to introduce and iterate both small enhancements and some substantial new features very swiftly. Each of the College’s 90,000+ members has an easily editable and findable profile in the system. A signature feature of the profile page, and indeed of the entire application, is the activity stream, which displays that member’s recent public activity across the environment. User profiles also display the public groups which members have joined and a list of the people that they have added to their personal network of contacts (Figure 1). The user profile is a key element which makes our system the sort of “open learning environment” anticipated by Jane Hart. Your view of other people and of their activity is not dictated by your membership of a particular course or programme. Your co-participant on a programme might also be a member of a special interest group, they might have published blog posts of interest, or they might have contributed to a discussion elsewhere; via their profile that you can view their activity. Early anecdotal evidence of how our members are using the system suggests that user profiles have a real influence on how other members discover activity. They are a key ‘node’ in the network via which members can find other activity and knowledge through people. Closely allied to user profiles, we provide the ability for members to search for other members. We also developed a lightweight social networking functionality which allows members to add other members to their network and thereby see an activity stream of their contacts’ latest activity. If a core benefit of a membership organisation is access to other members, then a facility like a simple online member search across user profiles feels like a basic and essential service for a 21st century membership organisation to offer. Again, these are also tools which allow informal learning to take place. 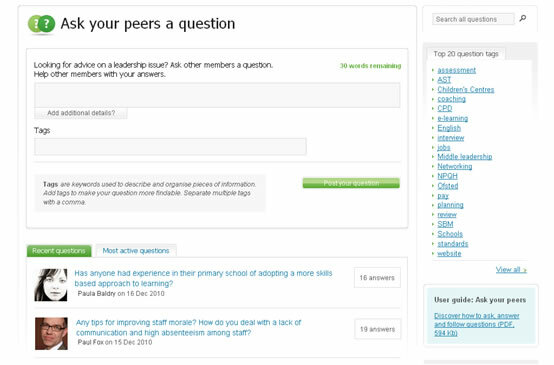 ‘Ask your peers’ is a lightweight question and answer tool focused around inviting our members to ask their peers for advice on a leadership issue or problem (Figure 2). It features a simple, Twitter-like text entry box for posing questions of no longer than 30 words. It was conceived of as one of the features of the new environment that would lower the barrier to entry to the community space, almost as a tactical offering to encourage and initiate engagement based upon a low level of initial effort. 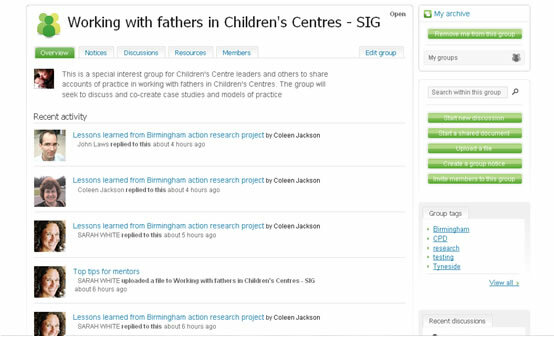 The use case we designed Ask your peers for, which we encourage and feature in our community management and editorial activity, is that of a school or children’s centre leader seeking advice from other members who have already faced a challenge or issue that they are now encountering. The ability to upload files. The ability to create lightweight, web-based shared documents. The ability of group owners to publish notices to the group. Each member of a group can start a discussion, upload a file or start and edit a shared document. We have also developed a specific version of the groups tool for use in our formal leadership development programmes which includes the ability to publish a structured sequence of learning activities into the group. Unlike the traditional VLE, and more like the social network, all of our members can set up their own open or private groups within the environment. The College has always run discussions and expert ‘hotseats’ on key issues facing the profession. National College discussions is an area, not unlike a blog, where we run these regularly-changing activities online. Each user has the ability to start and run their own personal blog. Blog posts can be openly shared with all College members or with specific groups only. Therefore, and this is a signature of the entire application, the tool can support closed, private activity in formal programmes as well as open, user-directed activity outside of programmes. Nine months on from launch in April, we feel that we can say with some confidence that the ease of use and the ethos (that we have actively sought to influence) of our professional network have contributed towards a really successful launch and uptake. In November 2010, the environment enjoyed over 402,000 page views, an increase of 142% on the number of page views for our previous environment, talk2learn, for the same month in 2009. The numbers of contributors to, and readers of, our National College discussions are higher than ever before. The volume of programme-related discursive activity is higher than ever before. Over 1,100 questions have been posed within Ask your peers and over 1,600 groups have been created. Our members’ engagement in activities they were not been able to do before – (search for other members, initiate their own groups and discussions, publish their own blog) accounts for a considerable amount of the new activity and it is on the increase. In our work to foster this kind of culture in an open environment which is heavily oriented towards user-generated content, we have learned a lot about the importance of community management and of activity which nurtures its ethos. The biggest change for our members, and indeed for the College, was that we passed a large degree of control over to the user to publish and to initiate activity. How you manage a community and nurture its ethos when you grant such control to its members is one of the issues that we have wrestled with since the first days after launch. Developing your service in response to emerging behaviour is good, solid practice for software development. It is also a sensible way to develop your approaches to the management of your community. In the early days of an online community it is very important to get a real feel for the tone, behaviour and motivation of your community members before you solidify your approaches to how the community is to be managed and nurtured. It is also vitally important to set the tone of the community where possible. Nevertheless, the behaviour you had not anticipated might be behaviour you want to promote or even behaviour you need to intervene to modify, perhaps because it sets a tone or creates expectations that you do not wish to nurture. Either way, it is important in the early days of a community to reflect regularly on the value for your members in the emerging behaviour you are seeing and to evolve your community management practice in response to that behaviour. The opportunities you have available to you to actively promote certain content and to editorialise can have a real impact on the tone and the engagement within the community. While you can build dynamic views designed to promote the discovery of the new and the most popular user-generated activity across your community, the consequences of lesson 1 – the arrival of the unanticipated – mean that those channels and menus can be populated by activity that is not necessarily in the best interests of your community. So, make sure that you have some simple ways to really promote activity and content, some of it your own editorial, that is going to enhance engagement and take your community in the right direction. A signature of several of the enhancements we have made to the environment since its launch has been to create more opportunities to editorialise and to feature content and activity. At launch, we had built into the environment a series of dynamically generated indexes, feeds and menus displaying the newest and most popular content and activity. Over time, as part of an effort to influence the ethos of the community, we have overlaid or even replaced some of these views of the environment with elements which allow us to editorially feature groups and questions and blogs. Early on, when you have got some really substantial, stimulating content contributed by members – a great question asked, a meaty discussion begun, a purposeful group set up – give it your backing and promote it prominently to all members. In so doing, the members who contributed to the activity gain some recognition, the tone of your community is influenced by the authentic voices of members and the content promoted gains more feedback and contribution from other members. These feel like some of the core lessons we have learned, from many others, in the early days of a longer-term effort to build and nurture a meaningful learning network that will have an impact on the leadership of England’s schools and children’s centres.